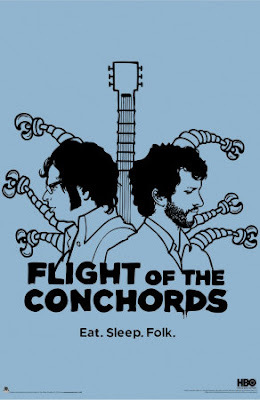 Flight of the Conchords have announced details of Irish and UK live dates. The duo will be supported by Kristen Schaal (Mel) in Dublin, Birmingham and Manchester. Arj Barker (Dave) will open the show in London. “Flight of the Conchords has had a great relationship with the UK in the past. In some ways you could say we got our start there, and we were always over at the UK's house. But then one night, some heated words were said and Flight of the Conchords ...left in a huff. We haven't been back since. That was five years ago. Now, we're coming back to say we're sorry. We'll also be visiting our old friend Ireland, an acquaintance that we had an uneasy first date with called 'The Netherlands' and some countries we have never met called Norway and Sweden.” said Jemaine.